Are you a driver? You don't have a car, but you want to drive for Uber & Lyft? Ride Share Rental provides the Uber & Lyft Car rental Program, you can rent a car for daily, weekly, and long-term rentals. The Uber & Lyft Car Rental Program includes the insurance, unlimited miles, scheduled maintenance for 30/60/90 days and rideshare inspection ready. So you don't have to spend the money on maintenance and insurance. The approval process is very easy with Rideshare Rental. No need to worry about the approval process with Ridesharing companies, we will take care all the paper works instead of you. So you can easily rent a car and drive for Uber or Lyft and other on-demand ride-sharing companies. Many Potential drivers are stuck with application process on Uber & Lyft because they don't have qualified cars. 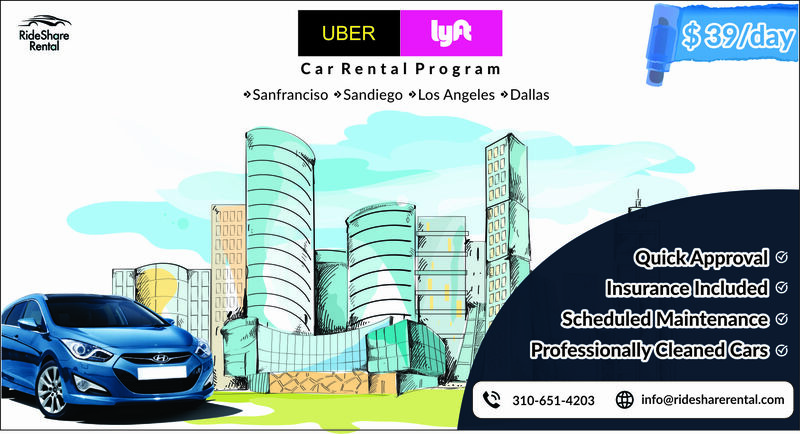 Rideshare Rental provides qualified cars for the Uber & Lyft car rental in Los Angeles, San Diego, Dallas, San Francisco, and Baltimore, Connecticut, Baltimore, Chicago, and Las Vegas. Buying the car is very expensive compared to rent a car from the car rental companies. RideShare rental provides the car rental service to drive for uber. All the cars are ready with Rideshare inspection and included with the insurance. The Uber car rental costs around monthly $880 per week. Drivers Age should be of 25 years & above. Ride share rental is a peer-to-peer car rental company. Are you having your own car, but was it not used? You can become a partner with rideshare rental; you can rent your car for ridesharing drivers and earn monthly. Sign up here and rent a car now..! RideShare Rental provides the car rental service to the lyft drivers. You can rent a car for daily, weekly and monthly basis. We are providing the Lyft car rentals in major locations Los Angeles, San Diego, San Francisco, Baltimore, New Jersey, Dallas and Texas. We are expanding our service to other cities soon! Drivers age should have 21 years & above. Driver should meet the Lyft regulations. Driving licence and valid credit/debit cards. Rent Car & Drive For Uber& Lyft Now!